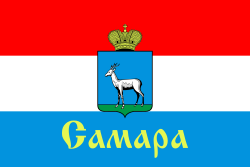 Samara (Russian: Самара) is the ninth largest city in Russia. It is the administrative center of Samara Oblast. About 1,164,685 people live in the city. It is in the southeastern part of European Russia at the confluence of the Volga and Samara Rivers. It is on the east bank of the Volga. Samara is the economic and cultural center in European Russian. They hosted the European Union–Russia summit in May 2007. From 1935 to 1991 the city was known as Kuybyshev (Russian: Куйбышев). Wikimedia Commons has media related to Samara. This page was last changed on 9 May 2018, at 15:11.